The Elmhurst College Jazz Festival enters its 51st year with an all-star lineup of the industry’s greatest performing artists, as well as some of the country’s best college bands. This year’s lineup of headliners includes the “evocative, majestic, magical” Maria Schneider Orchestra, trumpeter Sean Jones, trombonist Jiggs Whigham, drummer Matt Wilson, and pianist/composer Arturo O’Farrill and the Afro-Latin Jazz Orchestra. Each February, the Elmhurst College Jazz Festival welcomes the industry’s top professional musicians and the nation’s leading college bands for three days of performances and education. 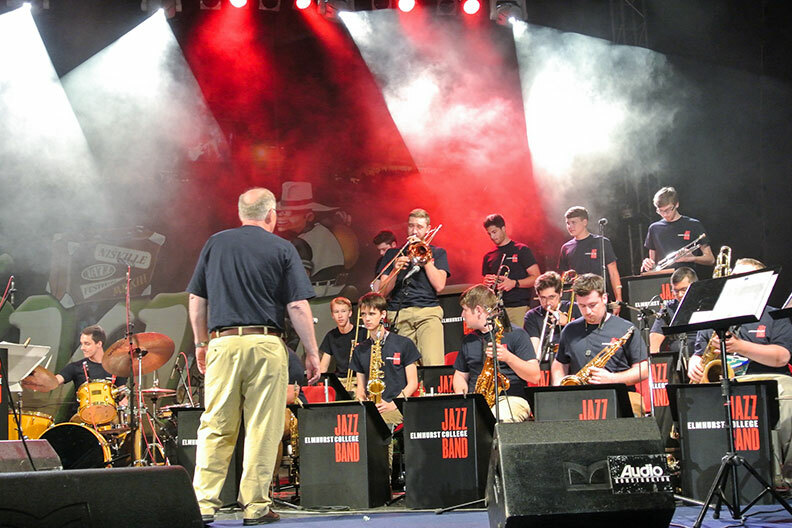 The college bands take turns performing for some of the greatest names in professional jazz today, who offer critiques and award honors in a variety of areas. Each night the Festival concludes with an exciting performance by one of the headliners. The Festival begins at 12:30 p.m. on Thursday, Feb. 22, with the High School Invitational, followed by a feature performance (at approximately 4:30 p.m.) by Sean Jones, Jiggs Whigham and Matt Wilson with the Elmhurst College Jazz Band. Friday’s evening session begins at 7:30 p.m. with performances by college ensembles and a performance by Arturo O’Farrill and the Afro Latin Jazz Orchestra. On Saturday evening beginning at 7:30 p.m., the Northern Illinois University and Elmhurst College bands perform, followed by the Maria Schneider Orchestra. The Sunday performances begin 11:30 a.m. with several Chicago-area college ensembles, and conclude with the Elmhurst College Jazz Band in concert with Festival artists and adjudicators Sean Jones, Jiggs Whigham and Matt Wilson. The Elmhurst College Jazz Festival will be held in Hammerschmidt Memorial Chapel. For more information and to purchase tickets, visit the Elmhurst College Jazz Festival website.